Farida Gester grew up in Wynberg where her parents rented a place. She was happily living with her happy big family. Farida chuckles when thinking back of that time staying with her parents, four brothers and three sisters. In about 1980 – Farida was around 21 years old – her family was pushed to live further outside the city. “The owners of the house in Wynberg claimed it for themselves. 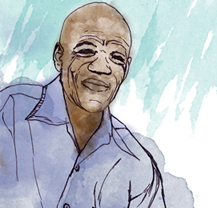 My parents only rented it and that time it was still apartheid.” Farida explains. The whole family moved to Lentegeur in Mitchells Plain, where they lived together for 30 years. When Farida talks about that time, she speaks of her father as a very sociable person, who welcomed all people into their home, regardless of their skin colour. There would always be visitors around the house, especially when her brothers scouted teammates to play football with them. When Farida’s two sons were old enough, they would also play football in her father’s team, with people from different townships. Her mother used to cook for all the people and everybody would have a good time. Her parents also supported her after she had a bad accident on her way to work. That is now 20 years ago, her children were still little. Farida was working as a machinist in a factory at that time, but after the accident she was forced to live off a disability grant from the state. It was very difficult for her to get by without her regular income, but her parents always supported her, like they did with all their children. With the years, her parents got ill and after her mother’s death, Farida did the cooking for everyone who visited their house or came by to play football. When also her father died, Farida decided to move out. The house in Lentegeur had only 3 rooms and was very crowded. With her siblings, nieces, nephews and in-laws living there all together, she had wanted to find a more spacious place for a long time, but she stayed for the sake of her parents, whom she cared for and looked after. It was important to them that the family stayed together. So after they passed away, Farida’s oldest son who was living in a two-room house in Portland, asked her to move in with his family. That is now 8 years ago. In Portland, Farida shared a room with the 3 grandchildren, two girls and one boy. Meanwhile, her younger son and his family were staying in the backyard of other people in Lentegeur. In December 2017, when Farida could finally move into her house in Ruo Emoh, she decided to take her younger son and his family with her. Farida is very happy to finally have her own house and her family is excited to live there. It will still take a while for her to see how this move will change her life in the long run, she says. For her, the move from Portland to Ruo Emoh was not such a big change, since she was already living in a house before. Also, they’re sharing a room with her other grandchildren. 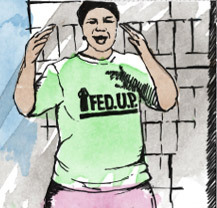 The living situation did not significantly change her everyday life. 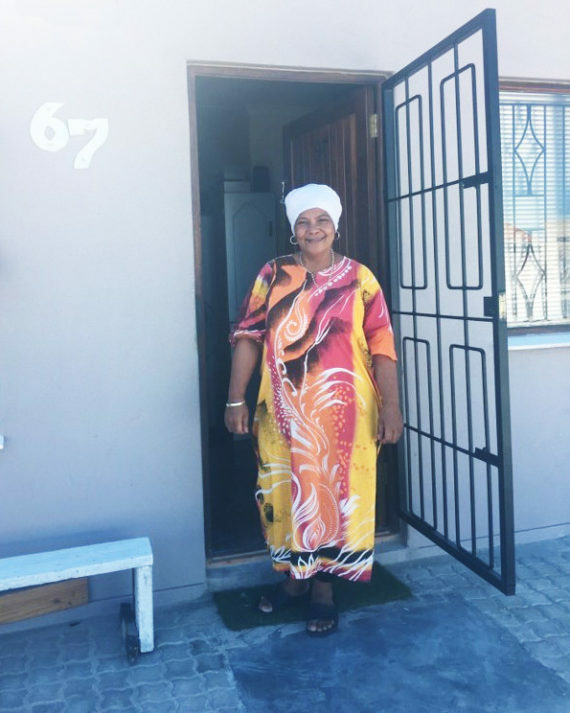 For her younger son’s family it is different because their former place in Lentegeur was not as spacious and they had to pay a high rent to be able to stay. Their move from the backyard to Ruo Emoh marked a significant shift in their lives. Certainly, everyone is more comfortable here than where we lived before, Farida says. It was 6 or 7 years ago when Farida joined the Ruo Emoh community. She heard about the project from the beginning when her neighbours in Lentegeur were talking about it. But since she was still living in her parent’s house with her whole family, she preferred to stay there. She cared for her parents when they were not longer fit and needed someone to look after them. It was only when she moved to Portland with her oldest son, she decided to join the community. It wasn’t easy, but her family supported her so that she could contribute to the saving scheme. When there were functions or meetings, she would always be there and help to push forward the project. She appreciates all the hard work everyone in the community has put into its success. The biggest obstacle in the process, in her view, was the city not cooperating with them. It is hard to see why the city didn’t let them build their own houses; why they had to make it such a long and hard struggle. The neighbourhood ratepayers also added to the problem; they did not want Ruo Emoh to be built. Farida says that they thought the new houses would be low-class houses and this would be bad for the area. Their resentment was nothing personal and Farida is positive that the relationship will improve over time, now that they can get to know each other. “It has to.” she chuckles. Farida has visions for her house, but it will take time to really decide on what to build. For now, she is very happy with how everything look. At some point she would like to extend a veranda, build another wall outside the house and add another room. It is even possible that they will add a second floor at some point. Time will show- for now, they like it as it is. She hopes that this project will spread so that more places like Ruo Emoh will exist in the future. Social cohesion and the feeling of solidarity are very important for Farida. This is how she grew up living with her family and also how she explains the success of Ruo Emoh. Everyone is like family here and looks after one another. This is how Ruo Emoh has been able to achieve so much. “Not waiting for others to help you out, but working together for a common goal, that is the key to Ruo Emoh’s success,” Farida says.